One thing is certain about life in Bristol: it’s quite unlike living anywhere else and can sometimes be well beyond the borders of the surreal. This feeling is enhanced by reading the Bristol Post, city’s newspaper of (warped) record. 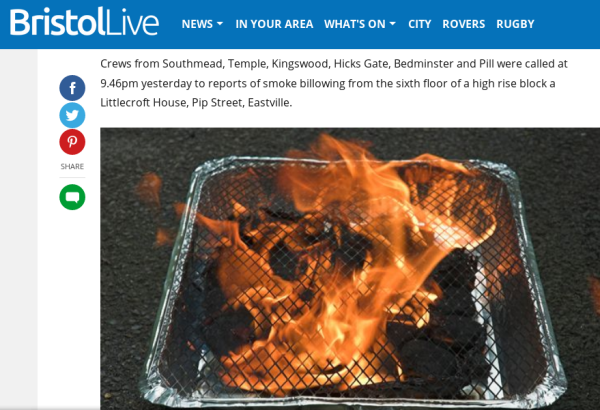 Just skimming casually through the Post website, readers may easily miss some real exclusives, such as this fire brigade incident reported yesterday by Heather Pickstock, who is alleged to be the paper’s North Somerset reporter. Crews from Southmead, Temple, Kingswood, Hicks Gate, Bedminster and Pill were called at 9.46pm yesterday to reports of smoke billowing from the sixth floor of a high rise block a Littlecroft House, Pip Street, Eastville. There’s just one thing wrong with the above sentence: it’s completely incorrect; there’s no Pip Street in Eastville and no high rise block called Littlecroft House either. A research technique known to ordinary mortals, but not to Ms Pickstock, affectionately known as “5 minutes’ Googling” reveals there’s a a council tower block called Little Cross House in Phipps Street, Southville, a good four miles across the city from Eastville. This entry was posted by Steve Woods on June 3, 2018 at 10:53, and is filed under Bristol, Language, Media, Oddities. Follow any responses to this post through RSS 2.0. Both comments and pings are currently closed.